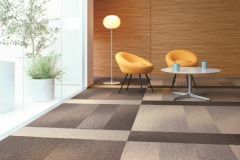 Carpet tiles offer a wide range of colours, patterns and textures. 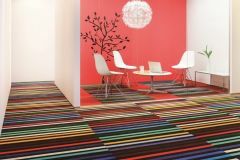 Many types of carpet tiles can also be over printed to offer customised designs & colours, providing an opportunity to create unique & stunning flooring alternatives. Carpet Options, Sunshine Coast stocks a wide range of carpet tiles for home & business use. For particular situations, carpet tiles can be the most cost-effective & durable flooring solution. Carpet tiles offer greater design opportunity because it is far easier with a modular system to create effects, even in small projects! Borders, accents and highlights can be simply created by inserting a tile of a different colour, even in a different shape. Carpet tiles are ideal for irregular shaped rooms or buildings. And with minimal waste, the use of carpet tiles is now seen as a sensible choice as they are an environmentally friendly flooring solution. Carpet tiles are used frequently in areas such as sun rooms, porches, decks & garages. They are also a great alternative to broadloom carpets in home offices, rumpus rooms & even kids' bedrooms. Carpet tiles offer greater design opportunity because it is far easier with a modular system to create effects, even in small projects! Borders, accents & highlights can be as simply created by inserting a tile of a different colour, even in a different shape. Carpet tiles are ideal for irregular shaped rooms or buildings & with minimal waste is also an environmentally friendly flooring solution. The versatility of carpet tiles offer long-term cost benefits because in areas of extreme traffic, they can be designed as almost ‘sacrificial’ for regular replacement, providing a greater cost efficiency for the entire facility. Carpet is usually replaced not because it has worn out, but more because it has lost its “contemporary look”. This can be more easily preserved through the use of tiles. Through the use of different yarn systems carpet tiles are extremely durable to even the harshest environments. Carpet tiles can be installed in nursing homes, child care centres, hospitals & schools. Generally the typical waste factor in a tile installation is not more than 4%. With broadloom carpets this can be as high as 12—14%. Also there are other savings with the installation of carpet tiles, for example a heavily partitioned or occupied workspace offers great savings in a tile replacement situation.